New drinking game: take a shot every time someone says ‘spring has sprung’. In saying that, spring has sprung. It’s time to trade in your solo mulled wine and chill for a cocktail jug and balmy bar sesh with your best mates. We’re spilling the long island iced tea on Brisbane’s garden bars you NEED to be partying in this social season, so listen (drink) up. For a springtime garden party with a difference, trot over to Brisbane Racing Club for their Spring Racing Carnival. Kick back on Derby Day (November 3) and Melbourne Cup Day (November 6) with make-your-own cheese platters, a Gordon’s Pink Gin bar (with fairy floss! ), and irresistible fried chicken from funky food truck Attila The Hen. Race, don’t walk – you can get tickets here. X marks the shot. The flavour of the season has arrived, and it tastes like luxury! 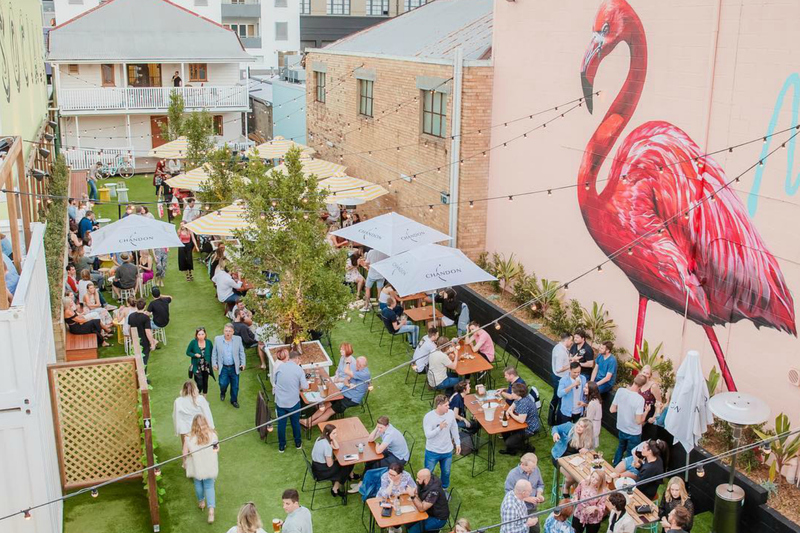 X Cargo is the place to be this spring, sporting lush greenery, astro turf and flippin’ flamingo murals. You’ll find a bit of the garden in your cocktail jugs mind you, with edible flowers and fruit throughout. The perks of being a wallflower at The Oxford Garden would be popping up in loads of Instagram shots. This joint is bursting at the seems with hanging plants, flowers and fiddle leaf figs. Perfect for a Sunday session, grab your gals and get down with some live beats and gourmet bar eats. The garden vibes are strong with this one. Nestled off Boundary Street, Covent Garden is a tropical oasis for the thirsty. Perched on what feels like the deck of someone who loves plants (and knows damn well how to keep them alive), you can take your pick from a vast selection of gin-based sips (they are a gin house, after all), or anything else that tickles your fancy. This is the place to be for a low-key party with high-key good times. High ceilings, big tree energy. Osbourne Hotel is large and in charge to say the least, offering 92 beers on tap, and ridiculously fun cocktails including the Byron Bay with Stone & Wood, mango nectar, lime and sea salt, and the Watermelon Margarita, ready to enjoy amidst a sea of flora. Dress up and turn up at your new favourite urban playground. Brick wall, waterfall, Cloudland thinks it’s got it all – and it does. Over three levels of luxe party spaces, you’ll find plants coming out of almost every corner, as well as an actual waterfall! With a healthy mix of live music, DJ’s and free entry, you don’t really have an excuse to miss out on experiencing this longstanding gem. Setting up shop in Fish Lane, Wandering Cooks is its own party garden in our beloved concrete jungle. Perfect for after drink works or a laid back catch up with your faves, you can indulge in craft beer, wines, spirits and the beauty of a lean, green, warehouse machine. Brookfield’s botanical bistro is a café by day, turning to a wild dinner party by night. Wild Canary is so damn stunning that it’s often booked out for a wedding, but on occasion the blessed team throw a dinner celebrating local produce (and sips). Keep your hungry eyes out for their next event. All cleaned up and ready to go, The Triffid’s new-look beer garden addition is worth writing home about. The new deck overlooks said beer garden, perfect for pints and people watching. Your daytime drinking adventures need to make tracks here. Ready, Newsteady, go. I’m sorry Mrs Brown, I am for real. Mrs Brown’s Bar & Kitchen is coming in hot with an extensive drinks list you’ll get to work through around hanging plants and sweet green babies perched on a divider wall. You need their prawn rolls in your life FYI – but whatever you choose, a great spring dinner party awaits. The grass is greener wherever you water(hole) it. - here for a good time, and a long time.